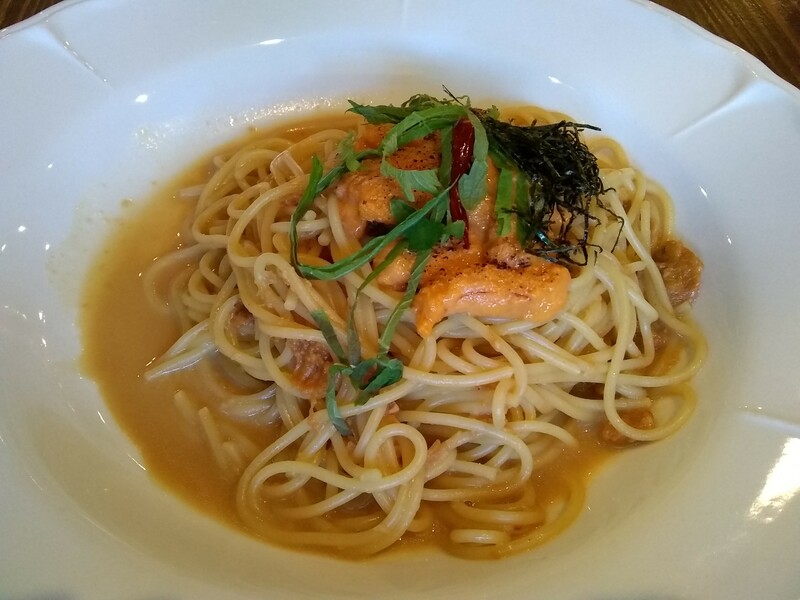 We read a review of a restaurant who specializes in Tonkatsu, and the picture of that looked really delicious. So we decided to try that out over the Father’s day weekend. 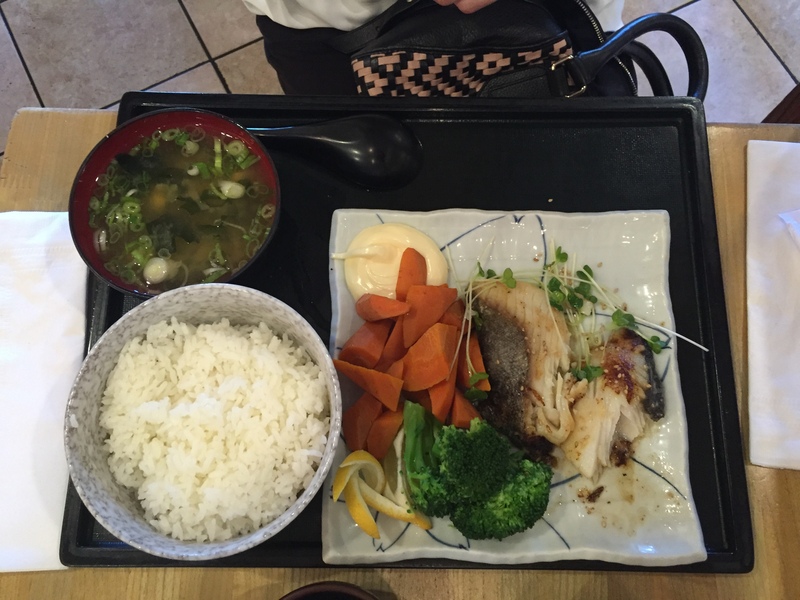 It turned out that the restaurant Kagura is one that I pass by frequently on the way to Mitsuwa Market. We made a reservation for 11:30am for Saturday, and we were the first ones there. 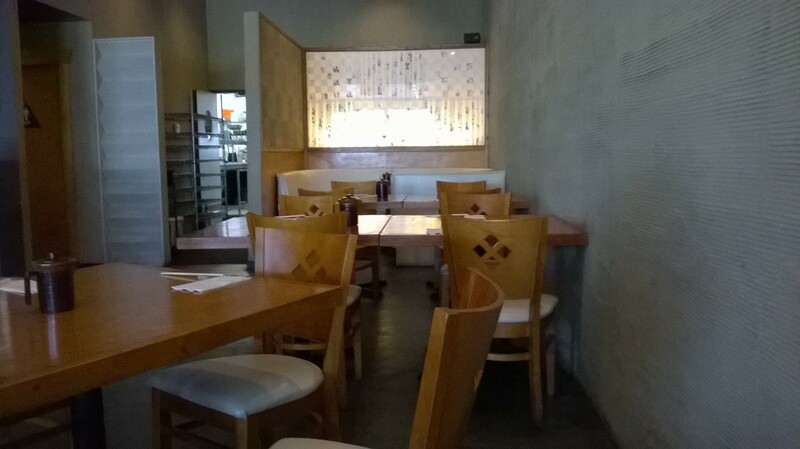 The inside of the restaurant is modern and airy and our waitress was extremely freindly. 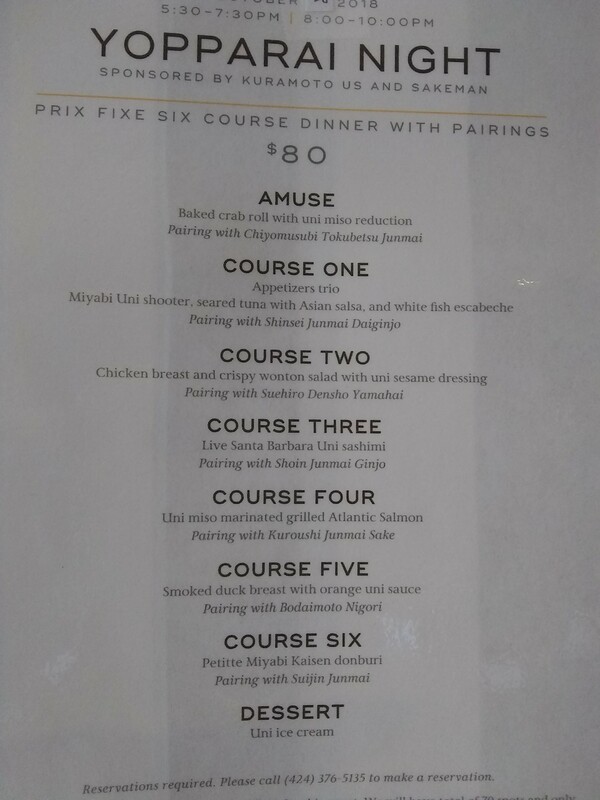 Both of us order the Grilled Black Cod in Miso, and a side order of the Millefeuille Katsu (Deep fried multi-layered sliced Black Pork). 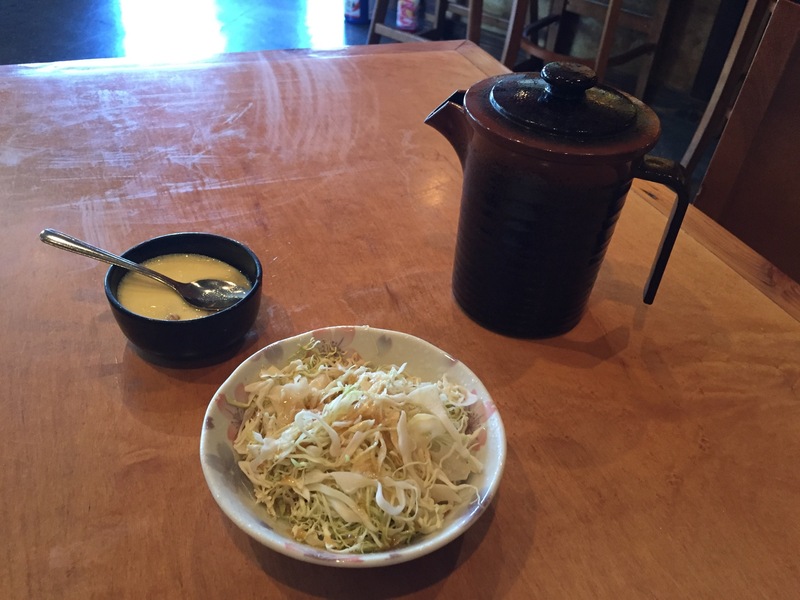 The lunch comes with sliced cabbage salad, miso soup, rice which are all unlimited, in addition to small amount Japanese pickled vegetables. The Katsu was probably one of the best that we tried. The outer crust was super light, crispy and not at all oily. The flavor is mild, and the meat was moist. The black cod was equally impressive, cooked perfectly, with the fresh taste of the fish not over powered by the miso. I think that meal started us wanting more Japanese food, so we ventured out to yet another Japanese restaurant nearby the next day. 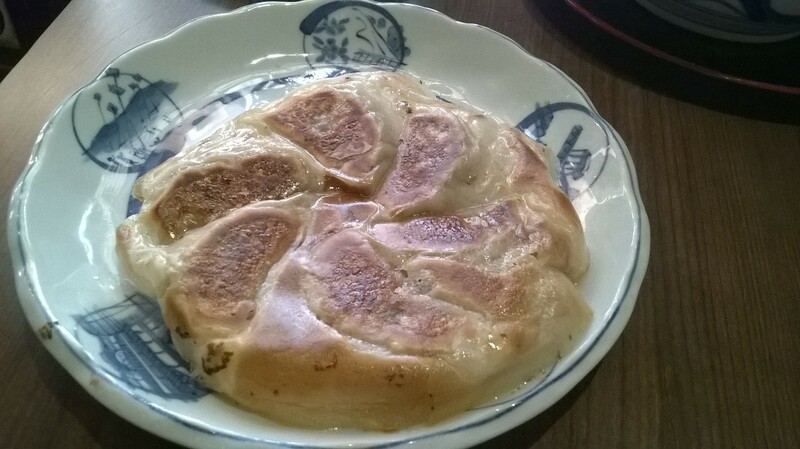 The restaurant name is Matsui. I had been to this restaurant a long ago, but the inside seemed to have changed a bit. My friend ordered the daily special, while I ordered the black cod dinner. 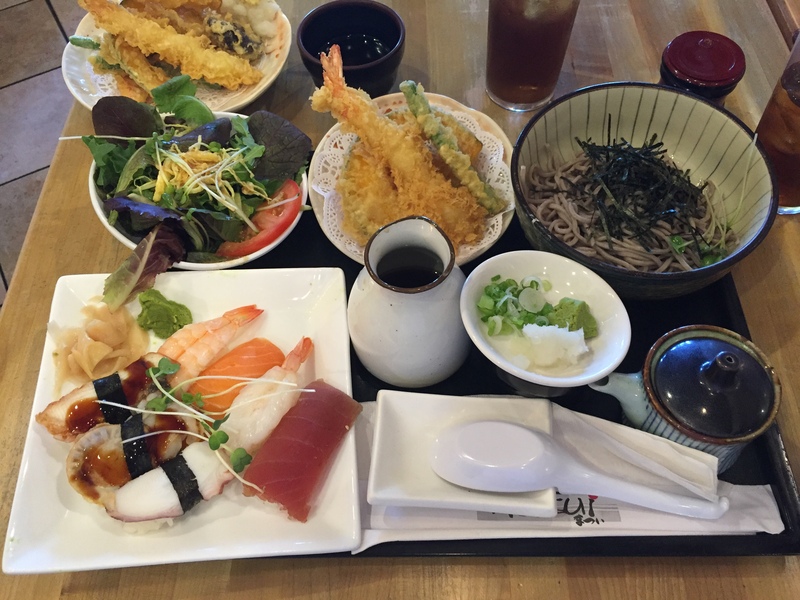 The daily special came with about 7 pieces of sushi, a plate of tempura, a bowl of either of soba or udon, and salad. My dinner came with two slices of black cod, broccolli, carrots, and rice. We also had a side order of 5 shrimp tempura, which seemed to be quite popular. I really enjoyed the shrimp tempura with its crunchy outer crust. 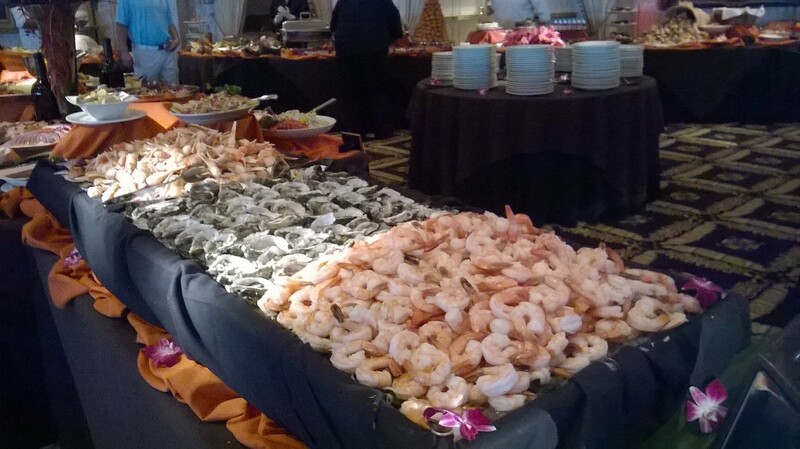 The shrimp was large and moist. I liked my black cod even though it was not as good as Kagura. 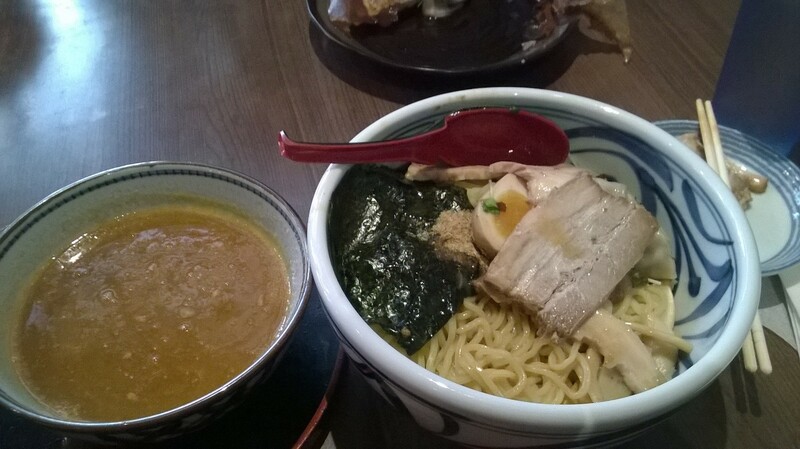 Originally, we were heading to Umenoya, a tiny ramen restaurant that serves a Jiro Ramen that comes with a humongous amount of vegetables atop the ramen (which is rather rare since most ramen comes with just a few slices of pork and almost no vegetables). However, at the last minute, I found out that it was closed on Tuesdays. So I had to quickly come up with another place near by since my companion was already on his way, hungry after an early morning fishing trip. Soba Sojibo came to mind right away. The last time I was there was probably about 2 years ago. 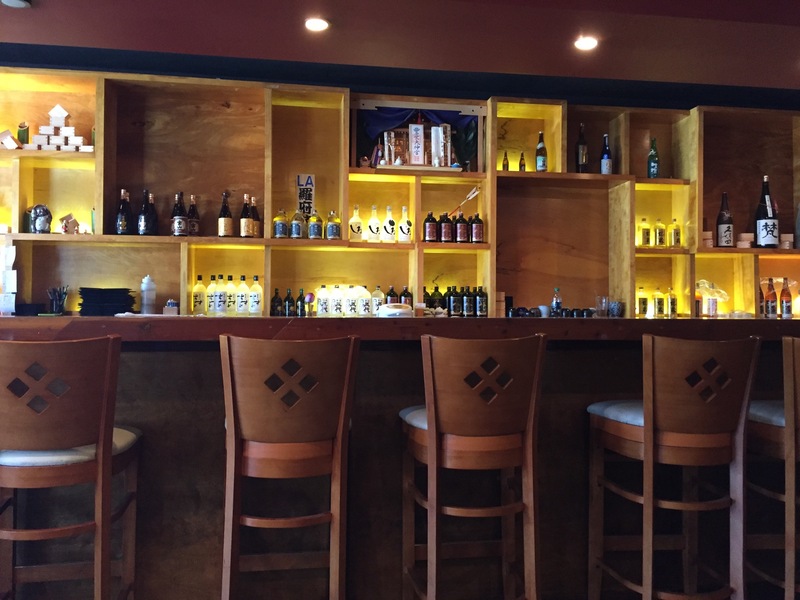 The place is not too big, but it is really comfortable and spacious inside. 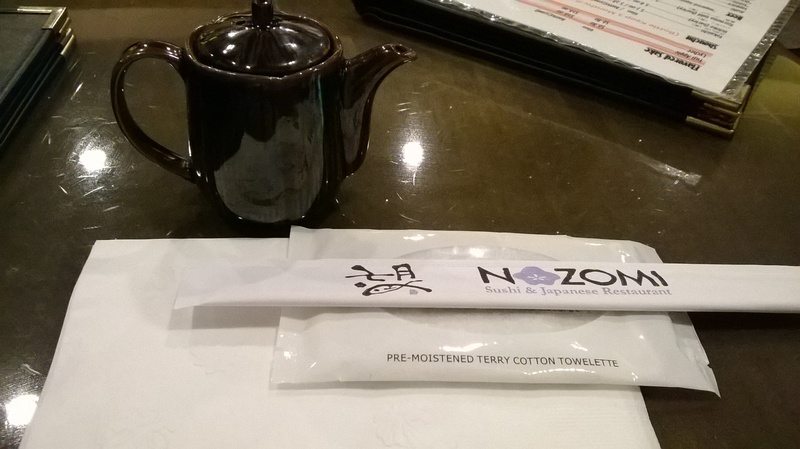 The waitress that was taking the order was sincerely helpful and refreshingly pleasant. 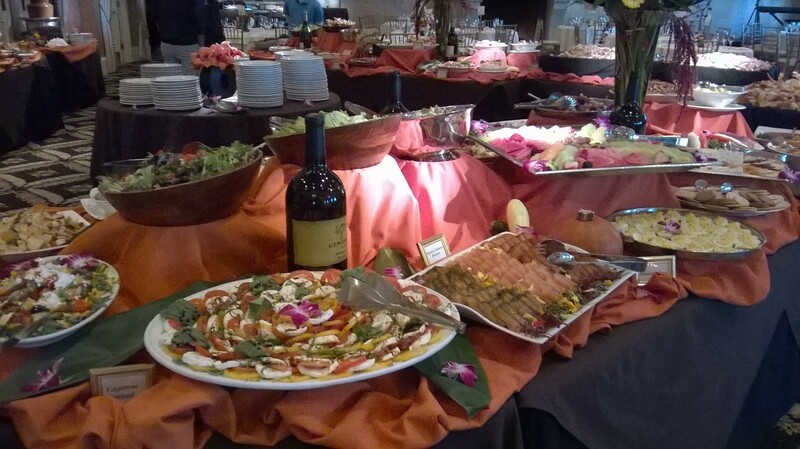 She explained the menu to me in details, and I was delightfully satisfied with all my selections. I ordered the special Bento Box with Sashimi for my companion while I chose the Cold Sansai Tororo Soba with a side of Pork Belly Don, and some fried mochi. 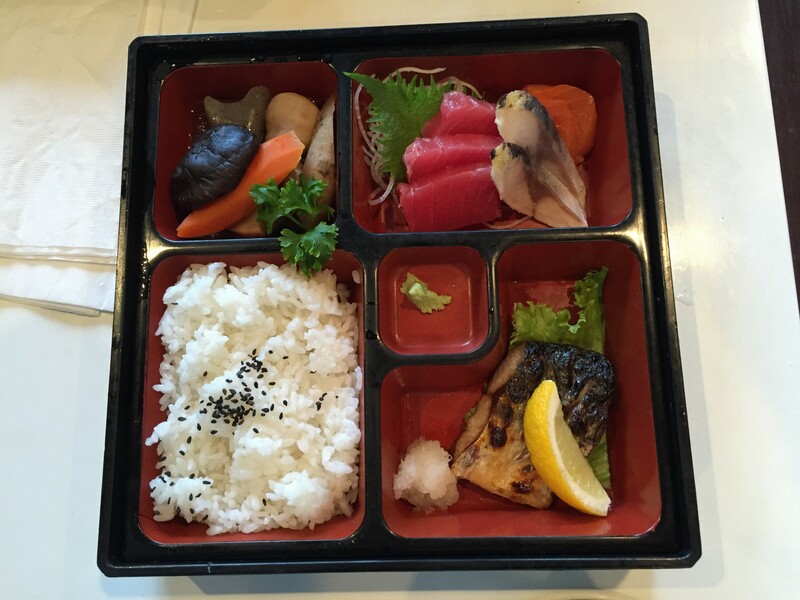 The Sashimi Bento Special had everything that one would want to eat at a Japanese restaurant. 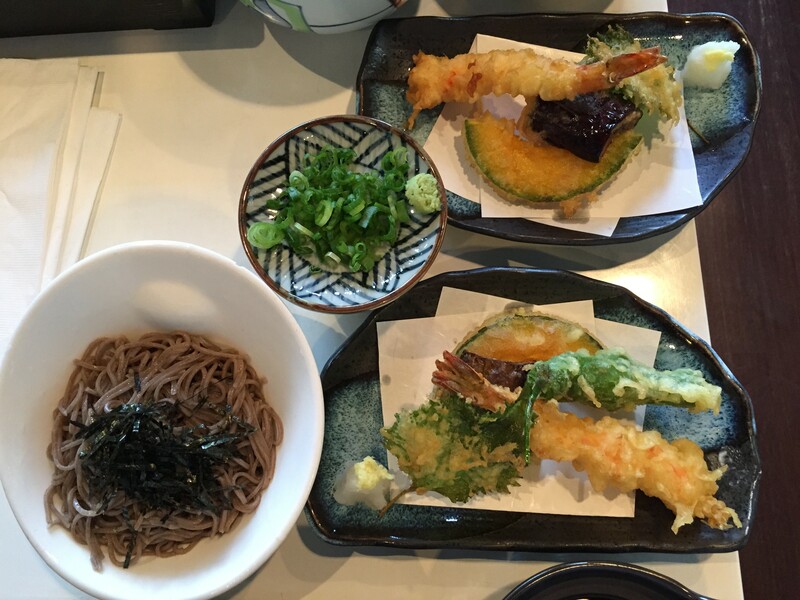 It came with probably the best and lightest tempura – with an extra thin, yet crispy and delicate batter, a small piece of cooked mackerel, at least 5 slices of sashimi, a side of salad, rice, a good size bowl of either hot or cold house-made soba, and a cup of Japanese steamed egg custard. It was a definitely a good variety for around $16. My Sansai Soba was as good as I remembered it to be since the last time I had it. 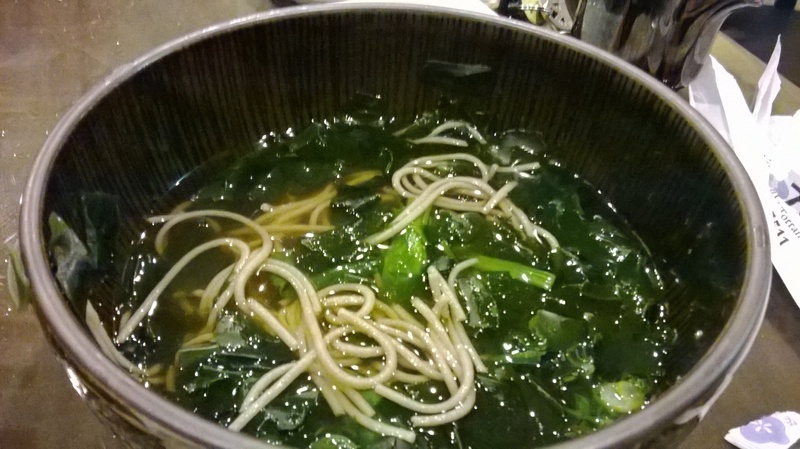 The cold soba tasted extremely fresh, and it balanced very well with the slightly salty mountain vegetables. 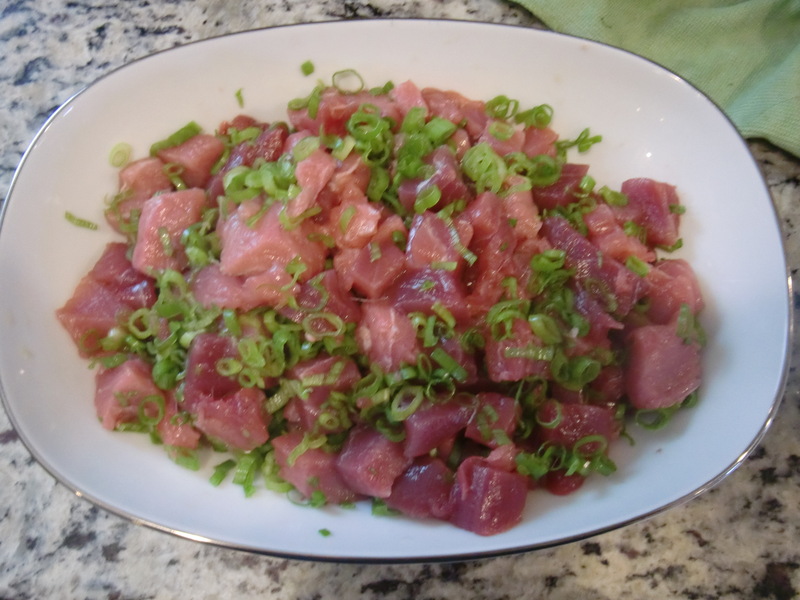 The side of pork belly over rice was simple but totally delicious. I also enjoyed the texture of the fried mochi. I was still a little hungry after my meal, and my waitress informed me that I could ordered extra soba next time, so that is what I intend to do the next time around. 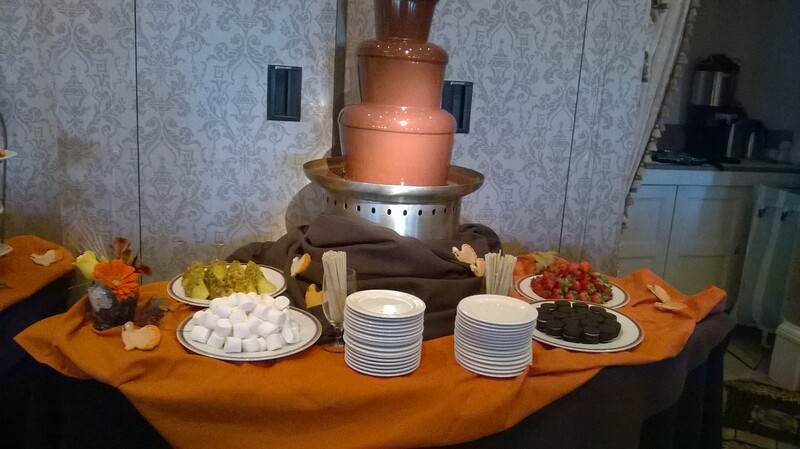 There were unlimited champagne, orange juice, coffee,..
All the ingredients were top quality and ultra fresh. The taste of the food was just right without being salty and overly seasoned. The service was attentive and yet not too formal. The servers were cheerful and everyone was in good mood probably because of the holiday. 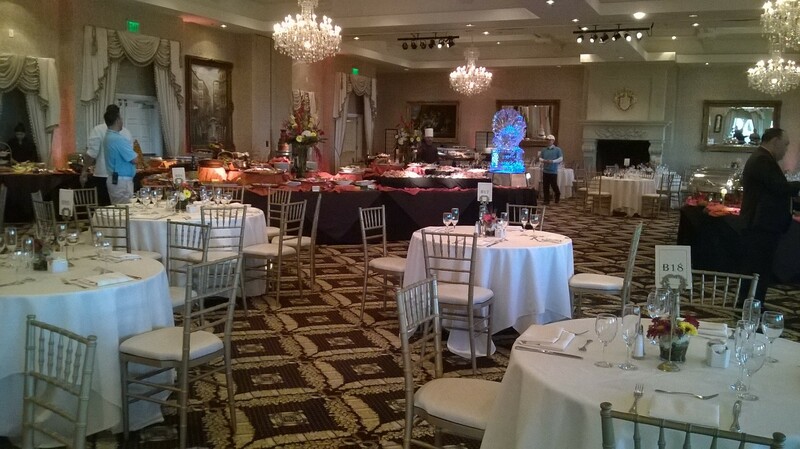 The room was elegant and spacious, beautifully decorated. The view of the Pacific Ocean was impeccable, unobstructed. 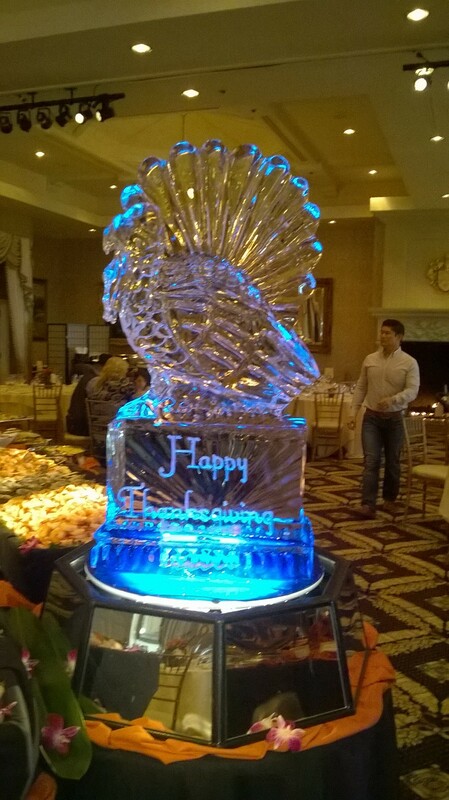 The weather was gorgeous, sunny and warm – a terrific day with amazing food for Thanksgiving. 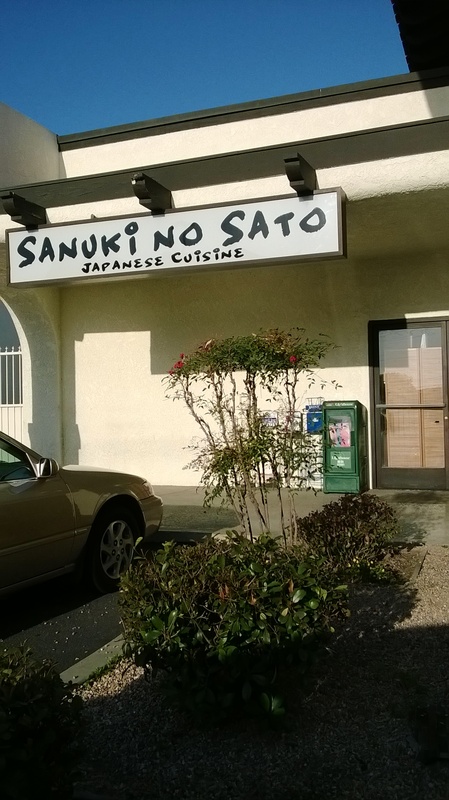 I was trying to think of a good Japanese restaurant to visit in the South Bay area, and I remembered a place that I had been to quite some time ago that was highly recommended by a Japanese friend. 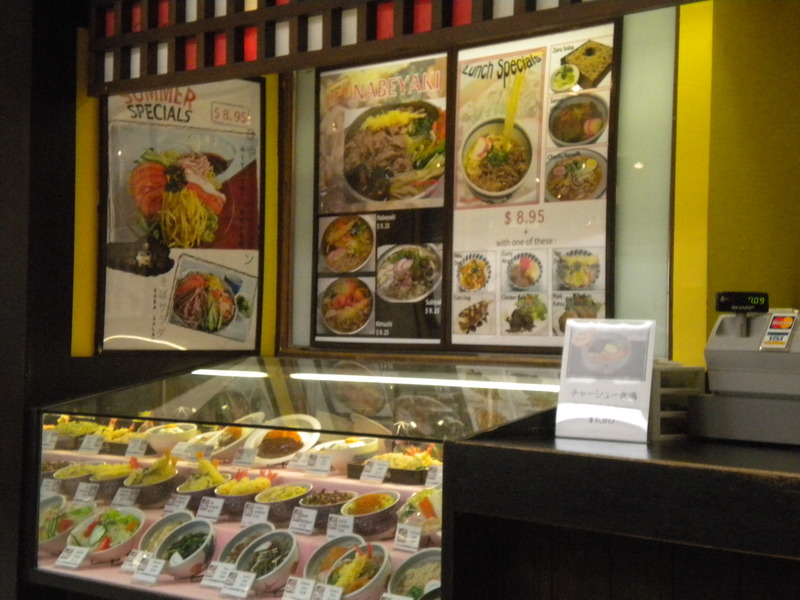 I did some research, and found that this place is famous for the noodles among Japanese people. The last time I was there, I was a bit overwhelmed by all the items on the menu. So this time around, I went online to do my research, looked through the whole menu to see what I should order when I get there. 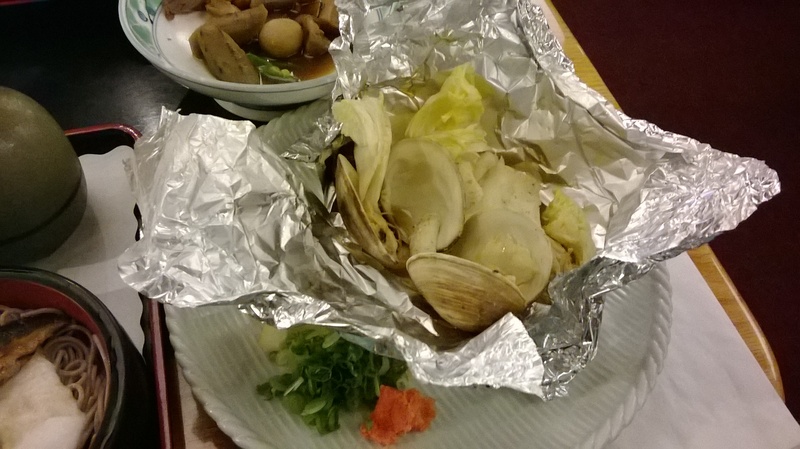 I decided to try the Chef Special: Steamed Chilean Sea Bass with clams in foil. I figured the portion size would probably be small, so I ordered the Sanshoku Wariko Soba which is a trio of mini soba with salmon roe, mushrooms, seasoned herring. 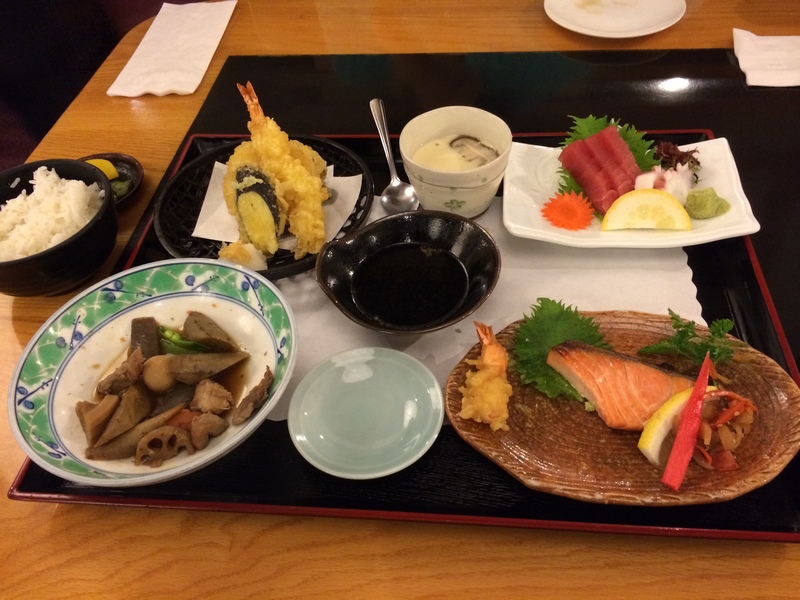 My companion ordered the Sanuki Gozen – Assorted sashimi, broiled fish, shrimp and vegetable tempura, etc. Let’s start with my friend’s super large order of various typical Japanese fare. There was the broiled salmon fillet, a plate of fresh tuna sashimi, the crispy tempura, a bowl of Japanese root vegetables and konnyaku which I love. 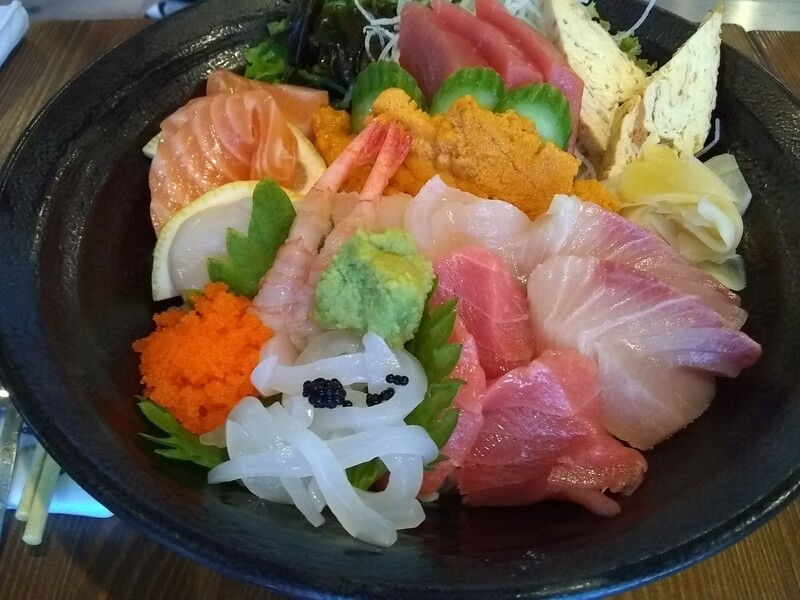 There was also a small bowl of steamed egg custard, some Japanese pickled vegetables, a bowl of white rice, and on top of all that, a bowl of udon of substantial size, and scoops of ice cream for dessert! And all were delicious and fresh according to my friend who was trying hard to finish most everything there were in front of him. My Chilean Sea Bass with clams was exceptionally fresh and cooked perfectly. As I predicted, the portion was on the small side, but delicious. 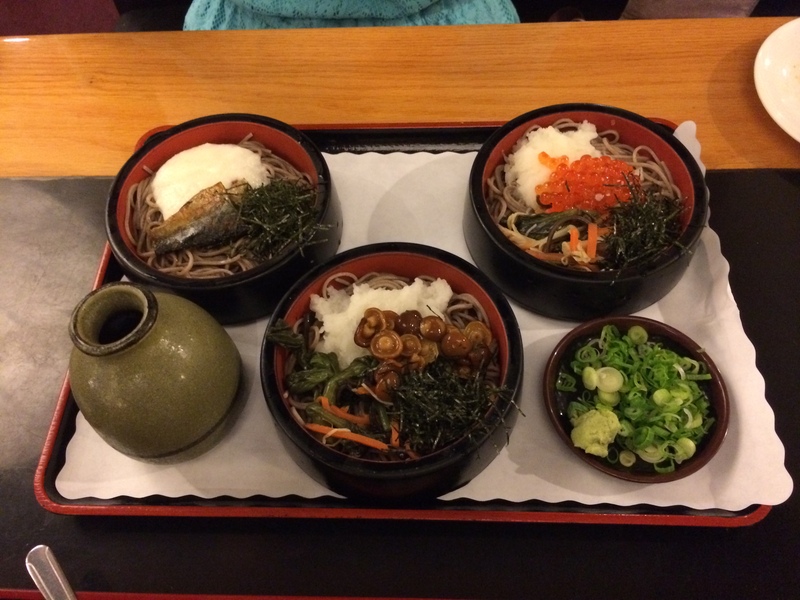 I was so glad that I had ordered the trio of soba. 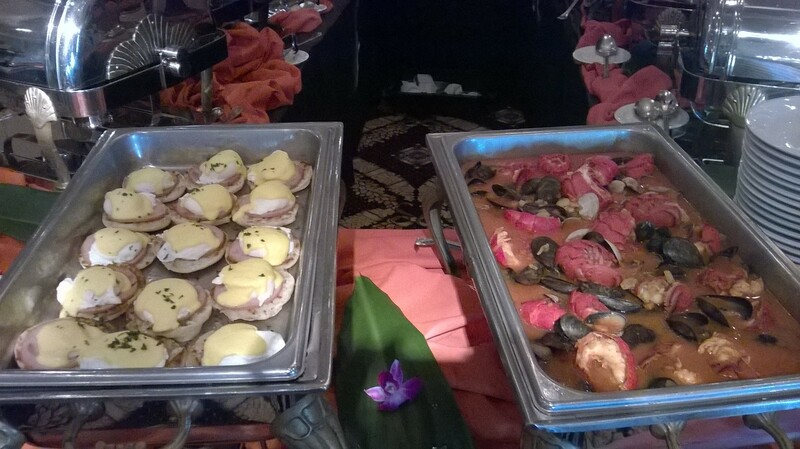 The presentation was quaint and appetizing. The three mini bowls looked and tasted fantastic. The taste of the herring stood out the most. 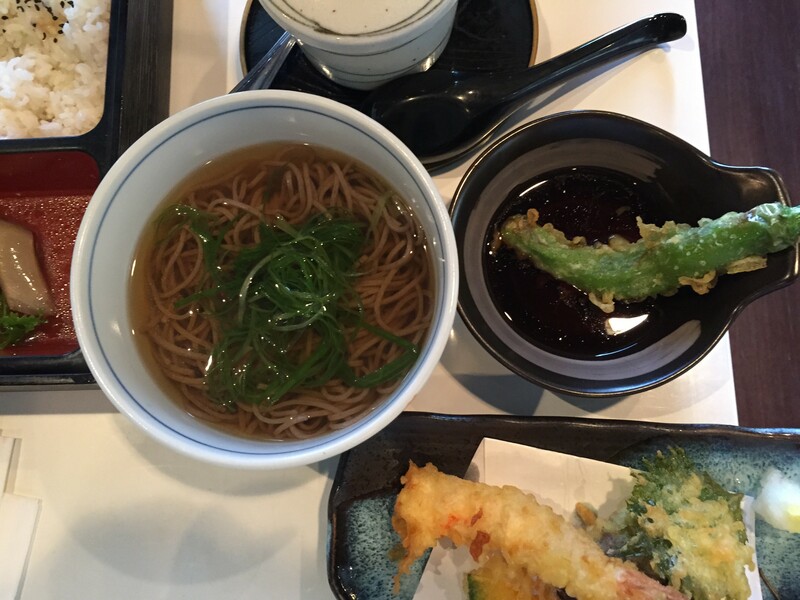 I would definitely come back again for the mini soba trio, and perhaps try something different on top of that the next time around. 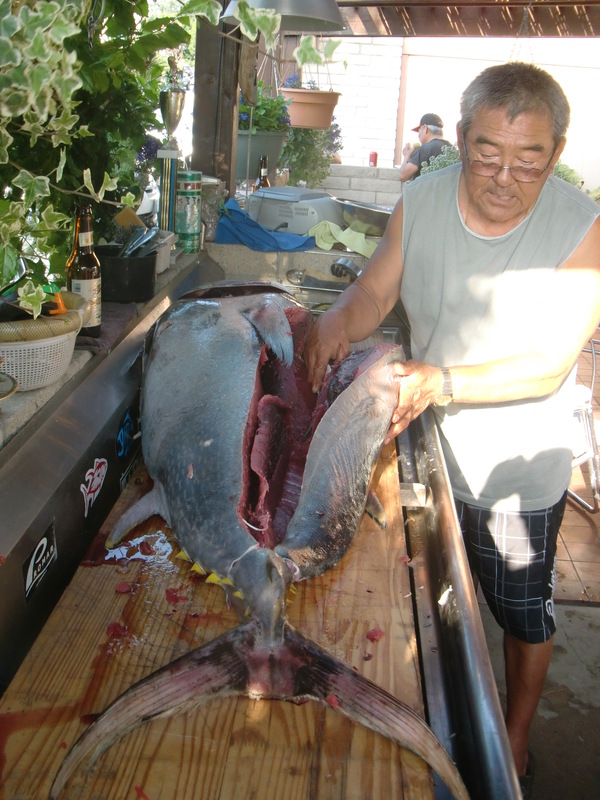 Aside from my all time favorite fish – black cod, served either as Eun Daegu jorim(Braised black cod with radish, Korean style), or Grilled Black Cod with Miso (Japanese style), my other beloved fish throughout the years has been the Grilled Yellowtail Collar (Hamachi Kama). 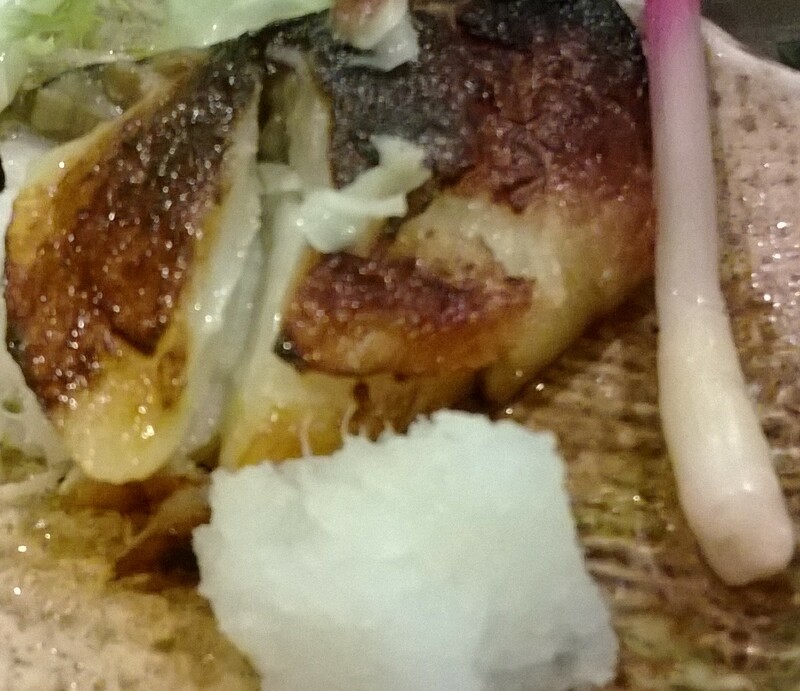 An old friend that I have not seen for quite some time wanted to have the Grilled Black Cod, so we went to this small Japanese restaurant inside a stripe mall with a few other Japanese eateries. Since the portion size of the Grilled Black Cod was rather small, I decided to get the Hamachi Kama (Yellowtail collar) as well, and an order of Soba with Seaweed, some Water Dumplings, some Uni sushi, and Sunomono (vinegared seaweed and cucumber). The Black Cod was delicious as expected – buttery, light and flaky. 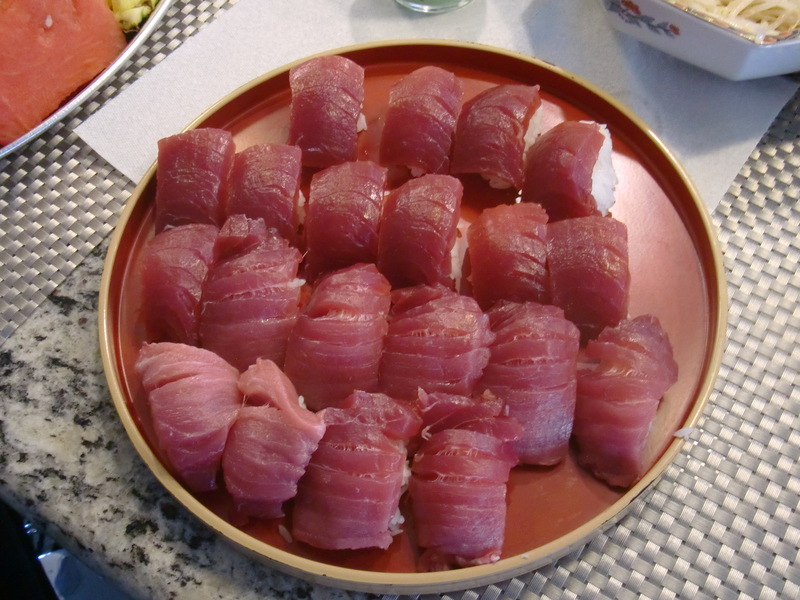 When I brought home an order of the Black Cod to my son to try for the first time, after his first bite, his eyes opened wide and exclaimed in amazement how great it was! The Grilled Yellowtail Collar, though not delicate like the cod, was in its own way, rich, flavorful, oily and very distinct in taste. The one served that day was huge in size, perhaps the largest that I have seen so far, for the price of under $15. There were so much meat, I especially like the dark meat portion near the bone, so lusciously delightful. 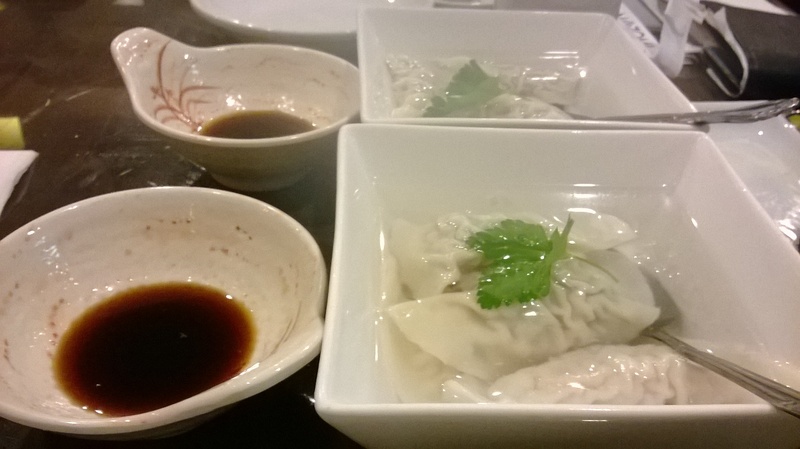 I was surprised by the Water Dumplings, I did not realize that they were served in cold water. After the initial shock, I actually enjoyed them quite a bit, and ate four of them. The Uni sushi was not as good as I had anticipated. 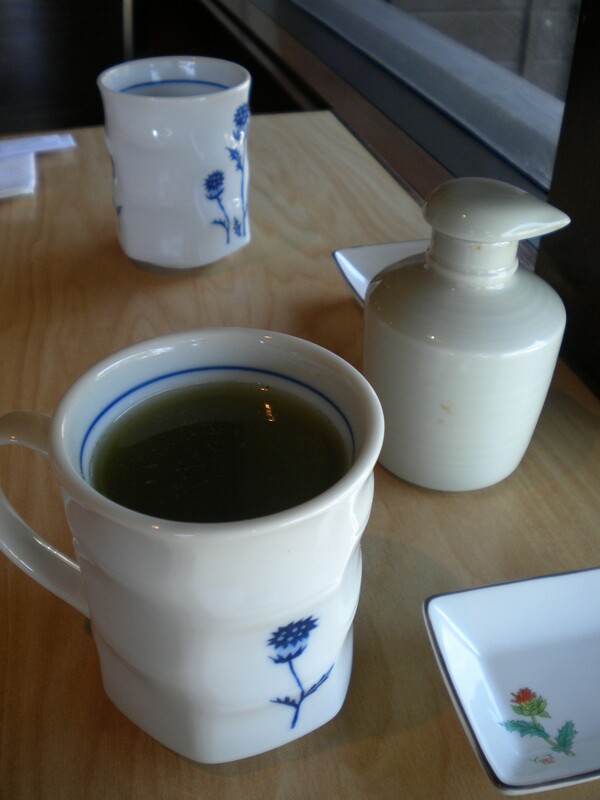 The Seaweed Soba, warm and comforting, filled with soft wakame and green onion, provide a satisfying ending to the meal. Probably the first time I came to the Mitsuwa Marketplace was over ten years ago. As soon as my son was able to sit in one of those light weight stroller, I started bringing him out for lunches at different eateries. As a Stay-at-Home mom, I needed to get out of the house in order to achieve some type of balance and sanity. 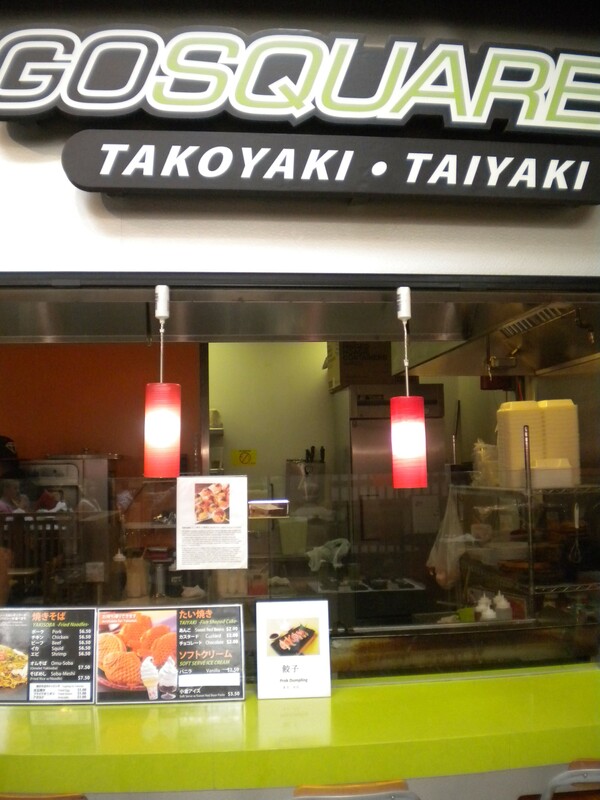 The Mitsuwa Food Court provided a good respite since it is casual and offer a variety of choices, and the food are all good and reasonably priced. I was able to relax and eat while my son slept soundly in his little stroller, or if he was awake, I would feed him something. As he grew older, he really enjoys Japanese food, especially the udons, and ramen. 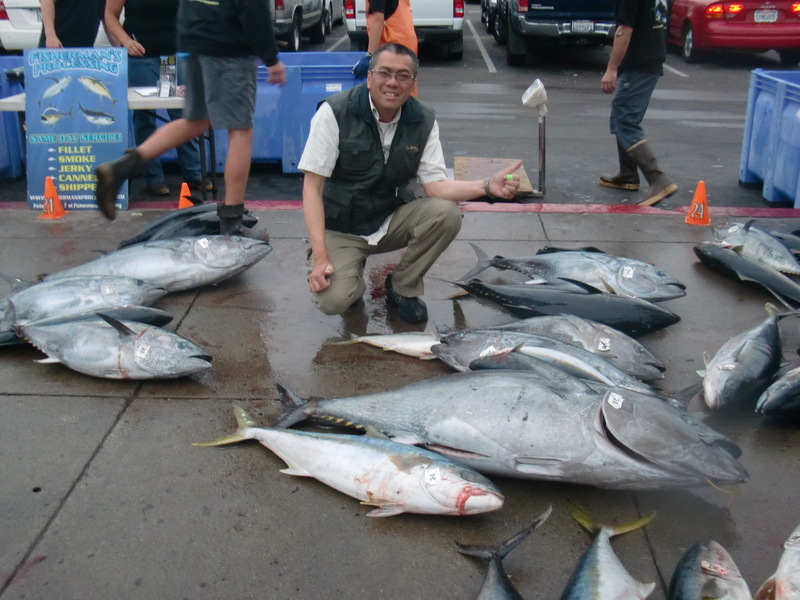 To this day, I believe that Mitsuwa is his favorite food destination. When the place is not crowded, the atmosphere gives a sense of calmness and peacefulness that we both find comforting. And one of our favorite thing to do after the meal is to venture into the supermarket section and look for my son’s favorite Japanese peach candy, and for myself, canned coffee with no sugar. From the beginning, I have been thoroughly enjoying these lunches with my son. These meal sessions not only provided delicious food tasting adventures, but most importantly, wonderful bonding opportunities for my son and I. We would talk about school, friends, and even life in general at these outings, something that we don’t really do at home, since we are always occupied with chores, computer games, emails, etc. 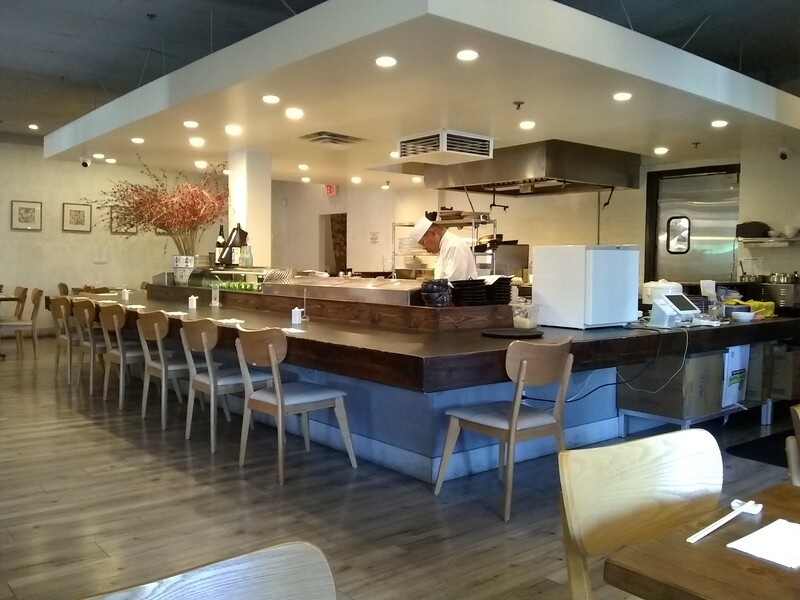 The restaurants inside this modest location are probably some of the best of their classes. 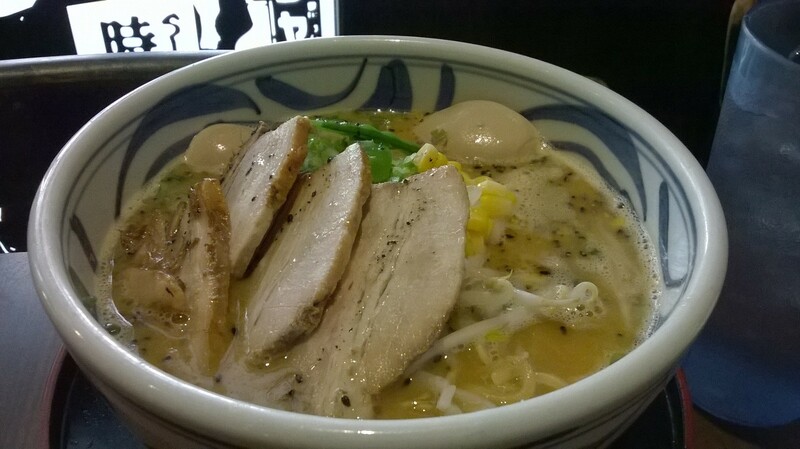 Santouka is well know for its distinguished ramen, which my son already decided is the best in Los Angeles. 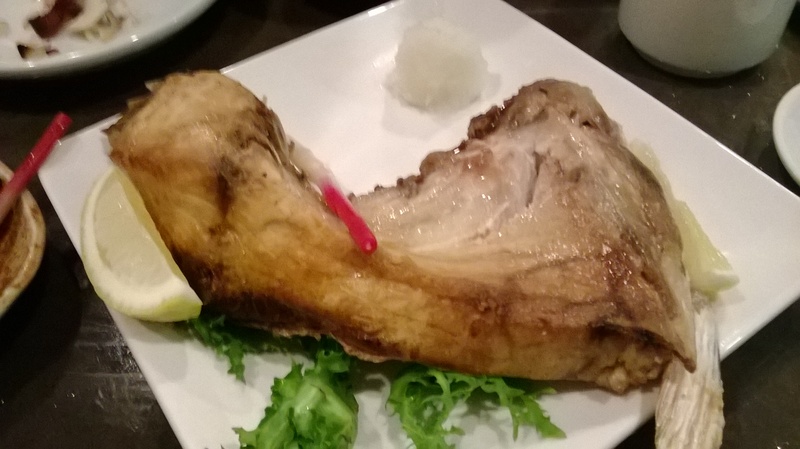 Katsuhana, which specializes in deep fried pork, chicken cutlet as well as fried shrimp, is truly superb. 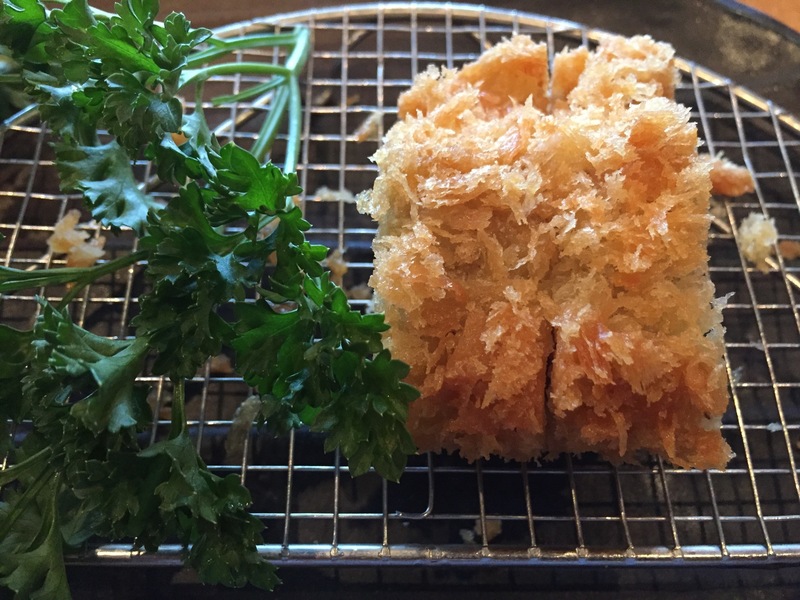 While I tried not to eat a lot of fried food, the Pork Katsu is hard to resist – moist, tender, and flavorful inside with a light and crunchy batter outside. The Katsu meal is a feast that comes with rice, soup, cabbage salad, fruit salad, small side dishes of tofu, and pickled vegetables. 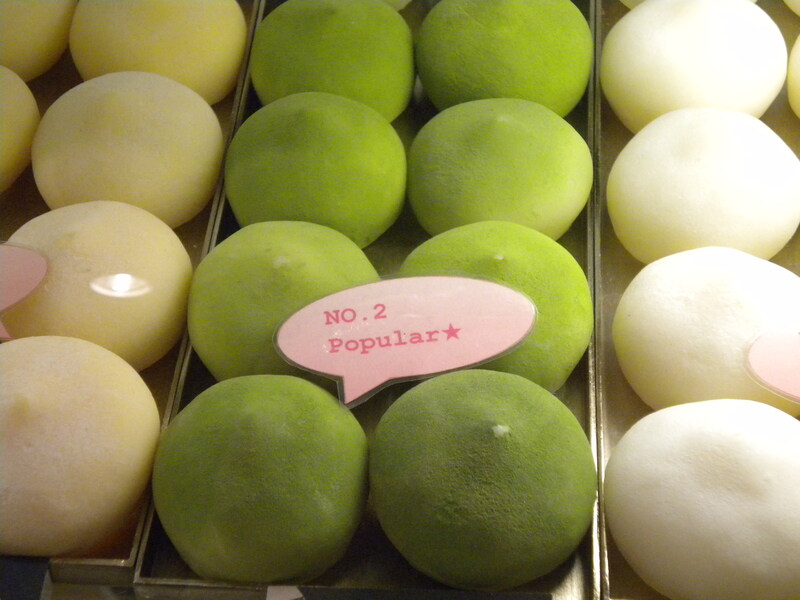 One of the newer comer to the marketplace is J Sweets , which offers the prettiest, most enticing Mochi Cream – a mochi ball filled with different delectable flavors. 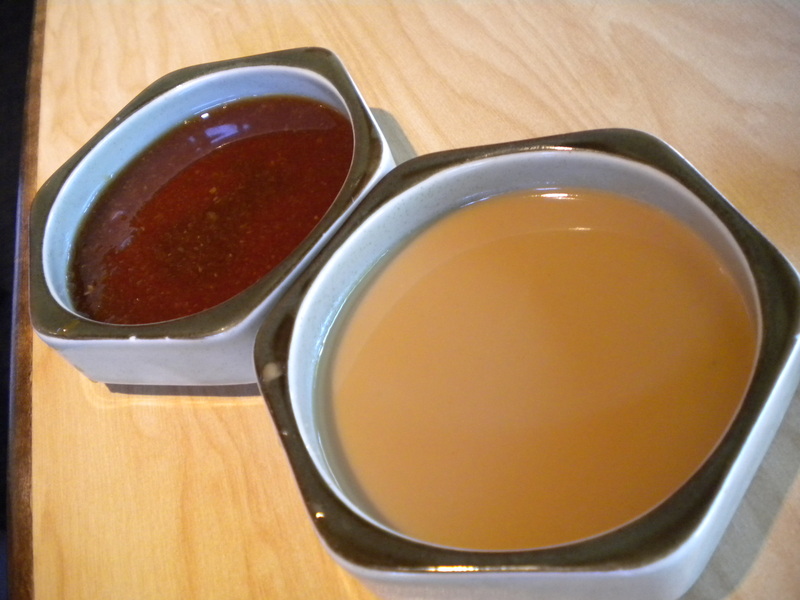 My favorite is the Cafe au Latte, not too sweet, but with a definite strong taste of coffee. 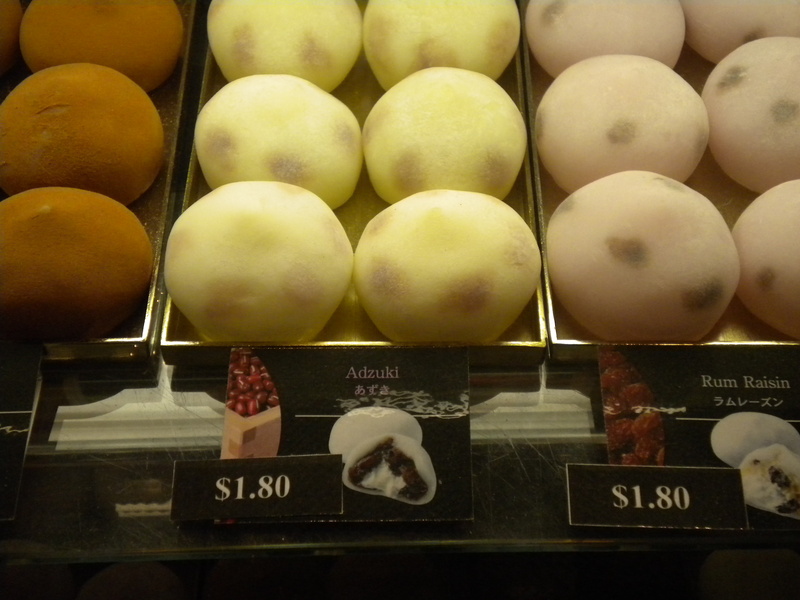 The Mochi Donuts look fantastic but have not tried yet. All the other cookies and sweets in the store are all so beautifully presented and packaged. However, the prices are high so I have not yet had the pleasure of tasting them. 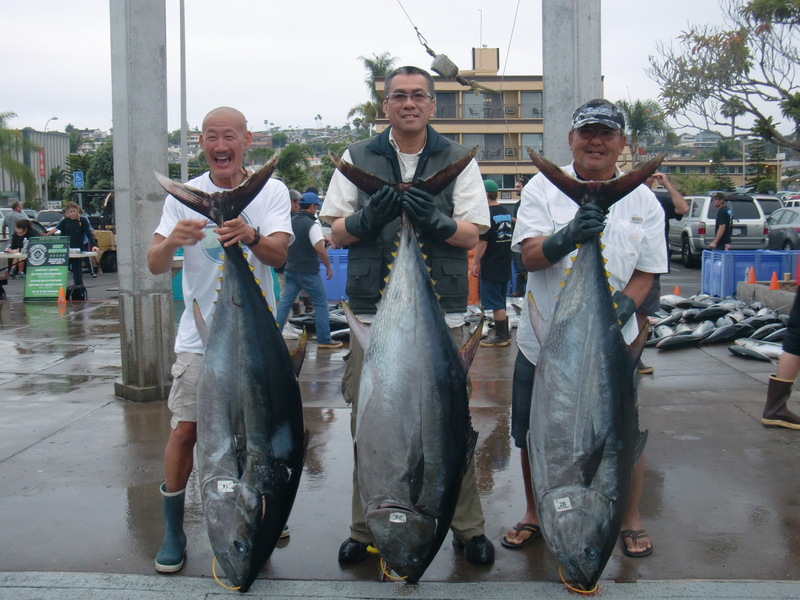 Miifune is the eatery that I have visited the most throughout these years. This place has a good selection of udons, sobas, and various combo plates. 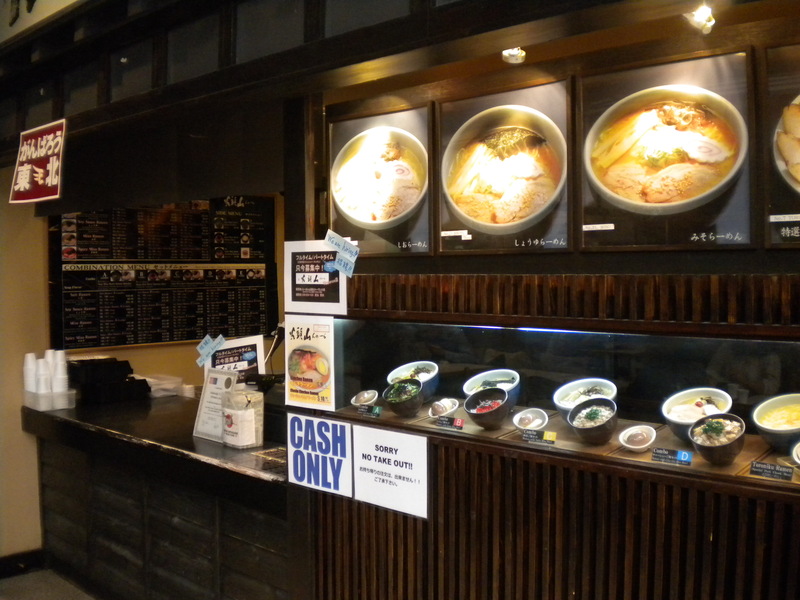 I particularly like the Wakame Soba or udon, the Beef Shabushabu, and the plain Curry Rice. The food is consistent and satisfying. 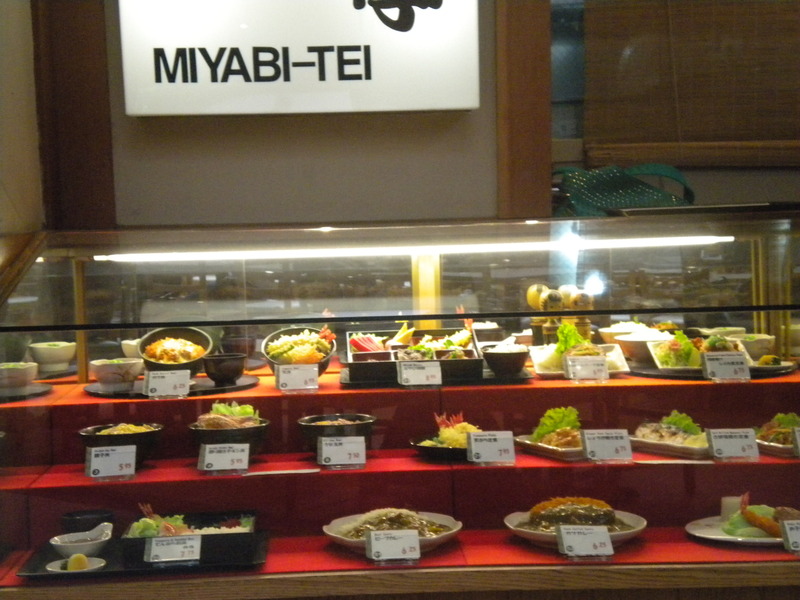 I really enjoy the Mackerel plate at Miyabi-Tei. 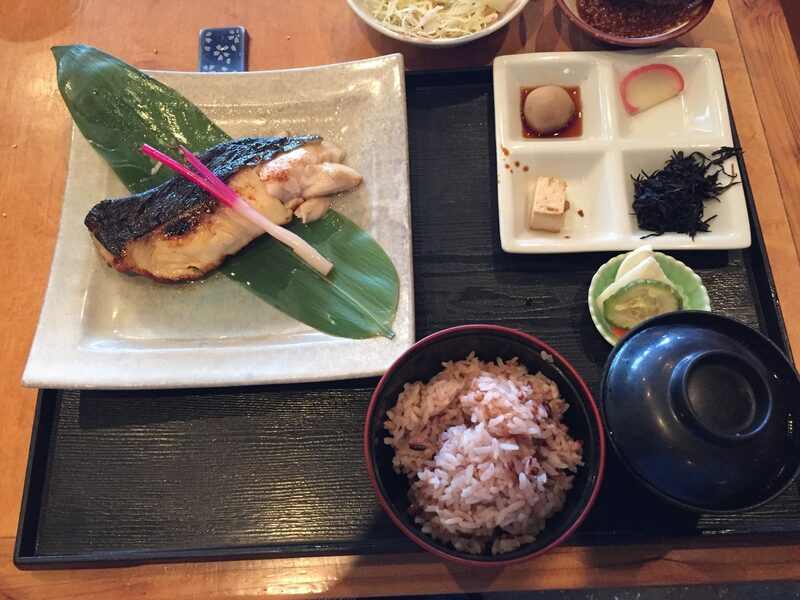 The oily, flavorful fish is grilled and comes with miso soup, a large bowl of rice and some shredded cabbage and little bits pickled radish. A bargain at about $7.00. I don’t know why I like these ball shaped octopus snack made with wheat flour based batter, pickled ginger, and green onion, and cooked in a special takoyaki pan. Maybe it is the fact that they are so usual in taste and texture, sort of soft and chewy, salty and sweet, an odd kind of mouth feel and sensation. 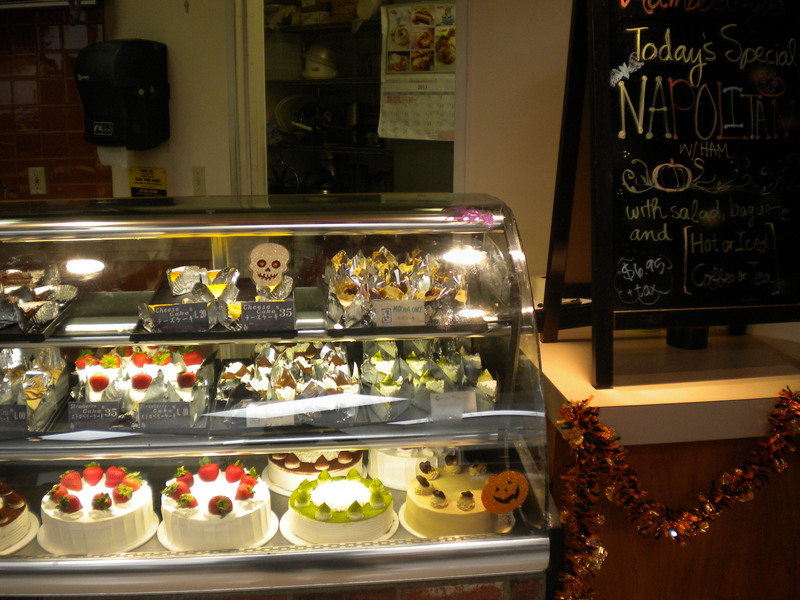 The Hamada-ya Cafe provides a more western style of food selections such as various spaghetti and pasta, risottos, and most delightfully, some of the tastiest cakes I have tried. 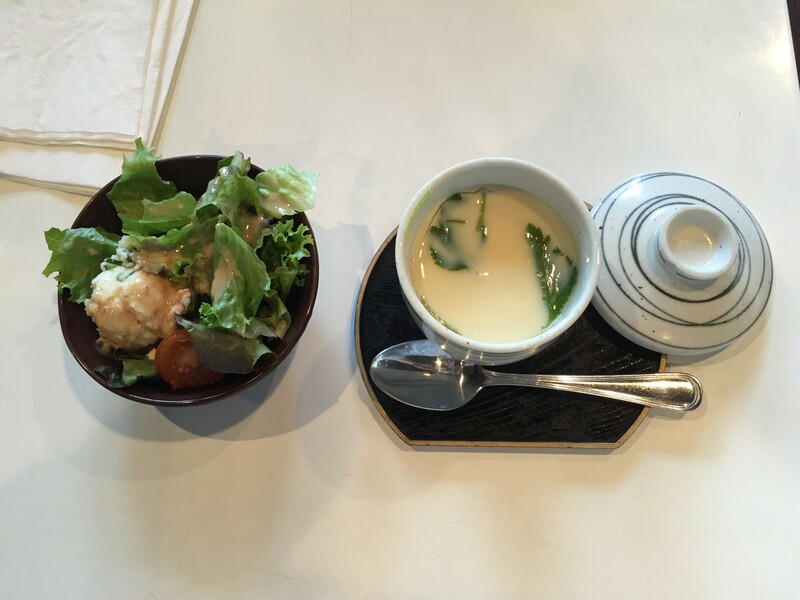 One can order a set meal which comes with a salad, some bread, and tea or coffee. Almost right next door, is the Hamada-Ya Bakery, which I had already wrote about previously as one of the most outstanding bakery in town. 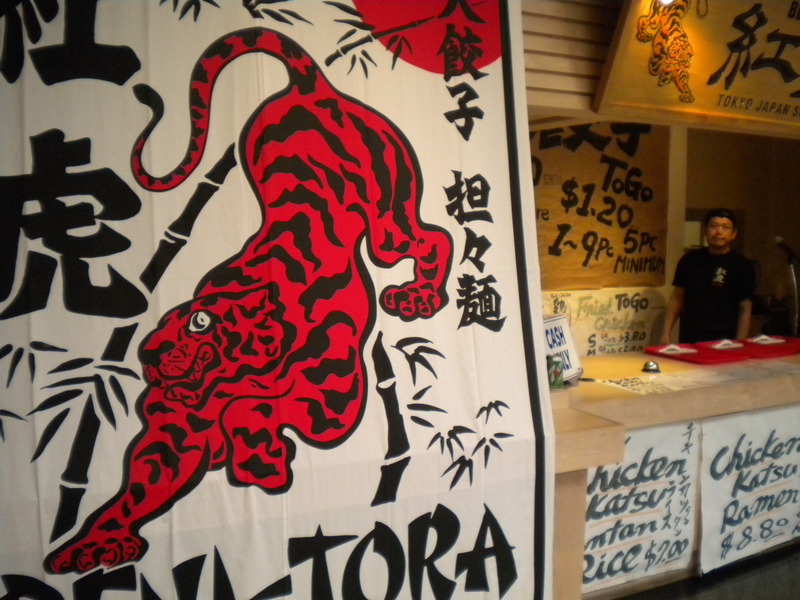 The soup noodles here at Beni-Tora are quite substantial in size, as well as the gyozas, which are huge. I like the fact the noodles come with ample vegetables. 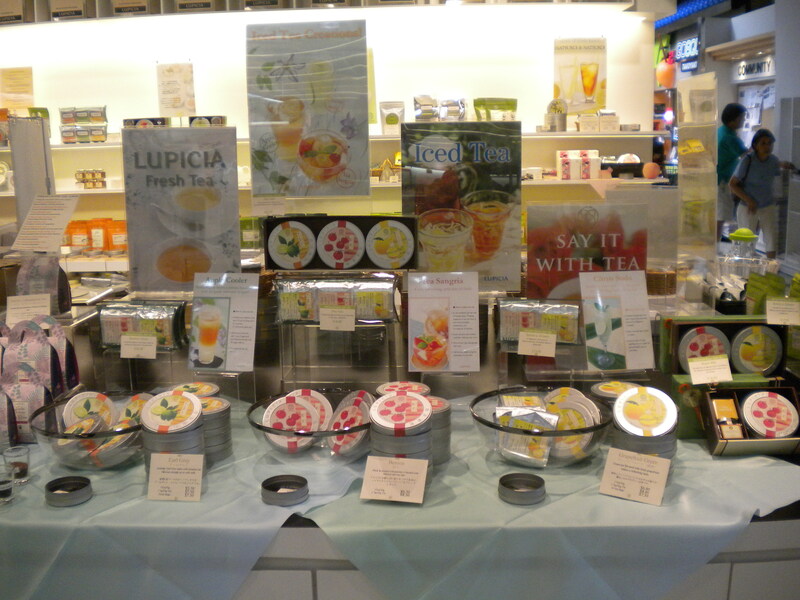 Lupicia, a clean, modern looking store provides over 400 types of teas throughout the year, ranging from seasonal teas to flavored teas. 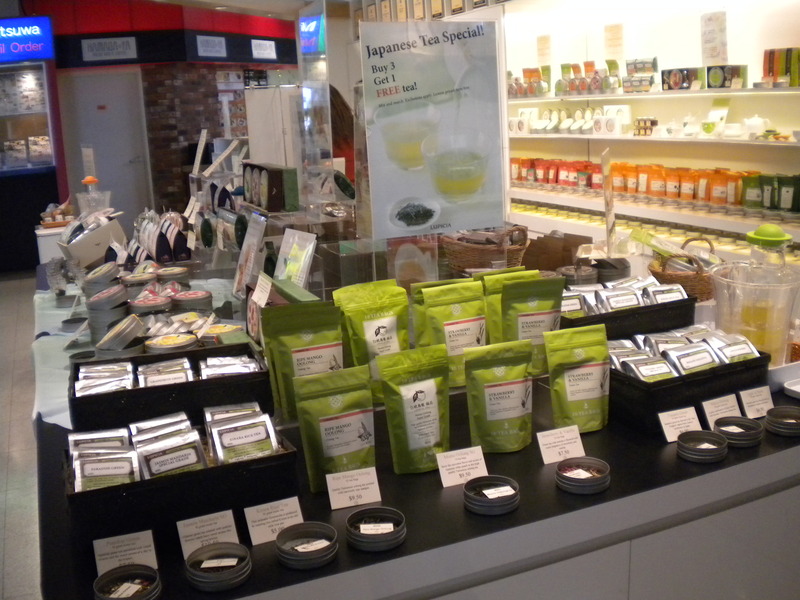 The sales staff are extremely enthusiastic and more than eager to provide a tasting to the teas. 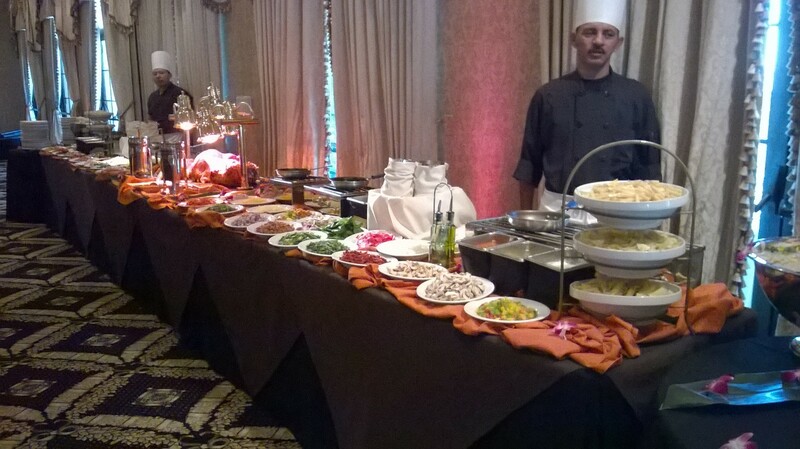 When one thinks of Benihana, the image that comes to mind is a chef expertly chopping up vegetables, meat, or seafood, and cooking up a storm in front of an excited audience who is hungry not just for the food but for a bit of entertainment. 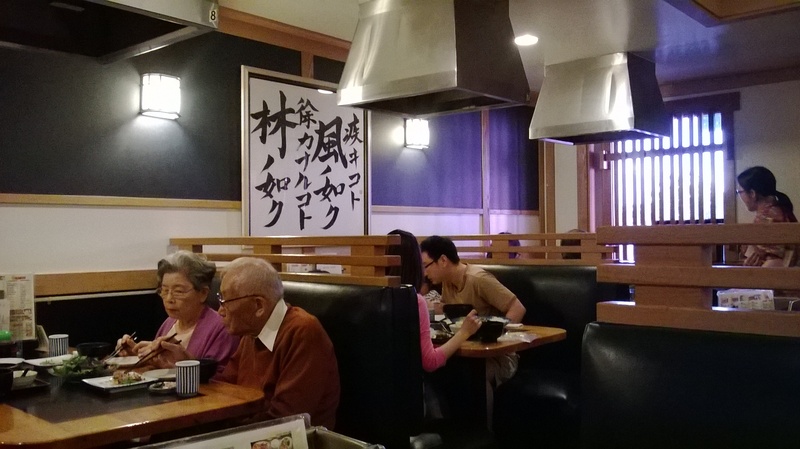 Teppanyaki is the style of cooking at this famous restaurant. The restaurant was started in 1964 in New York by Hiroaki Aoki, also a wrestler who qualified but did not attend the 1960 Summer Olympics. The name of the first restaurant, Benihana of Tokyo, was named after the “red safflower” which was the name of the coffee shop owned by his parents in Tokyo. 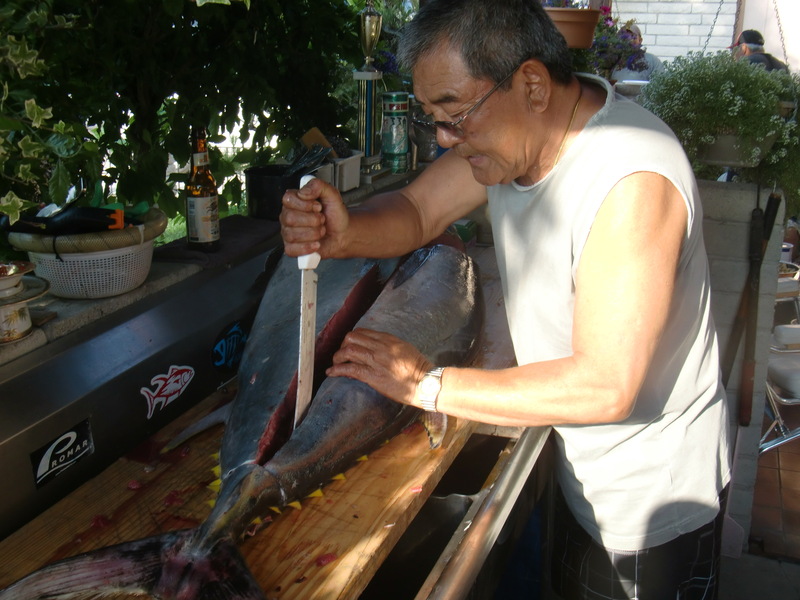 Aoki’s idea was for the meal to be theatrically prepared by trained staff at a communal table. 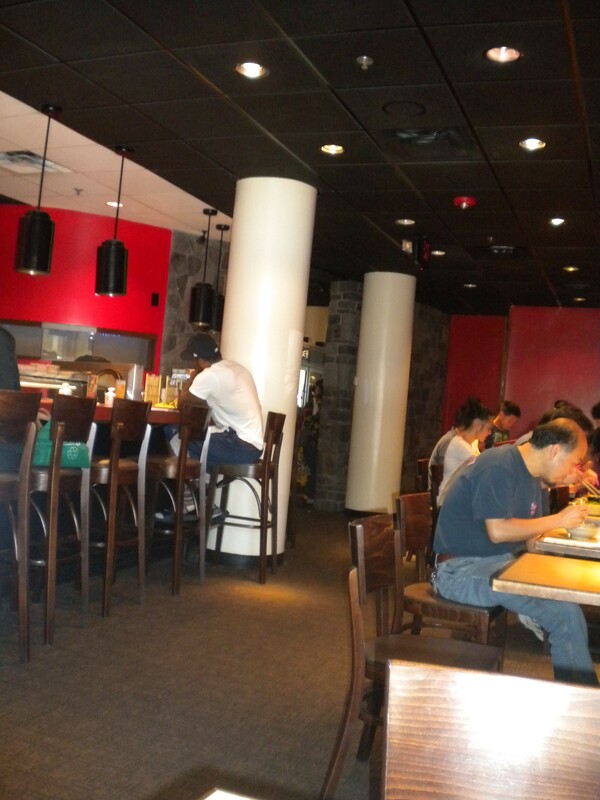 Teppan meaning “steel grill”, and yaki meaning “grilled” or “broiled”. Guest would place their order at the table, and be able to watch with amazement as the food items were sliced and diced and flipped into the air. I, like most other patrons of this restaurant, started enjoying the food here at these Teppanyaki tables. 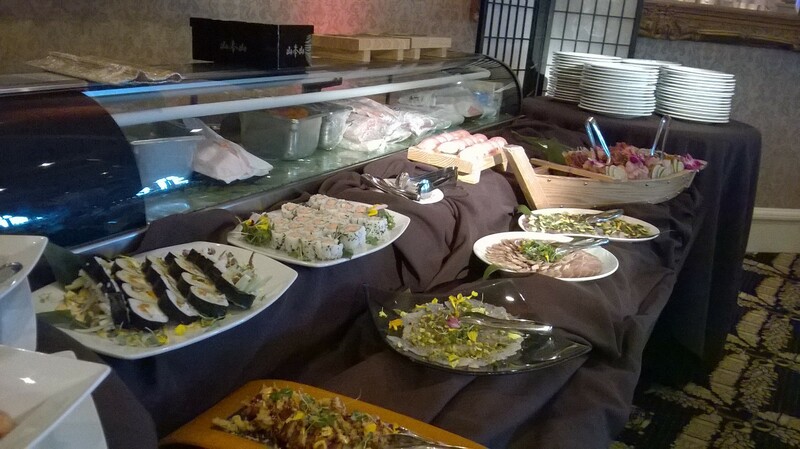 Then one day, a friend mentioned that she has been taking her son to Benihana for the Sushi Boat special. “What is that?” I asked. She explained that for lunch only, the restaurant serves a combination of Chicken, or Beef Julienne, or Salmon, with half of a California roll, Shrimp and vegetable tempura, sashimi, soup, salad, edamame, steamed rice and fruit, served inside a huge bamboo “boat”, and all that for around ten dollars. 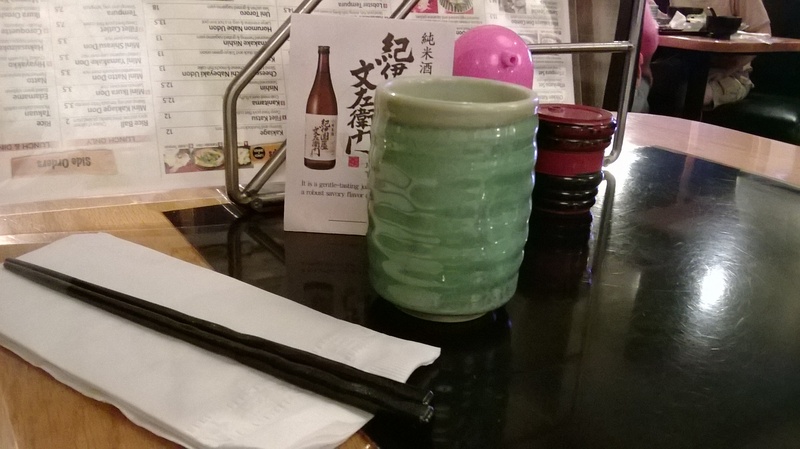 I was not sold right away, but one day, tired of the long wait for the teppanyaki side, we decided to just eat at the sushi side of the restaurant, since we were told that we would be able to order anything from the hibachi menu. It was actually nice to be away from the crowd and the noise and fumes. 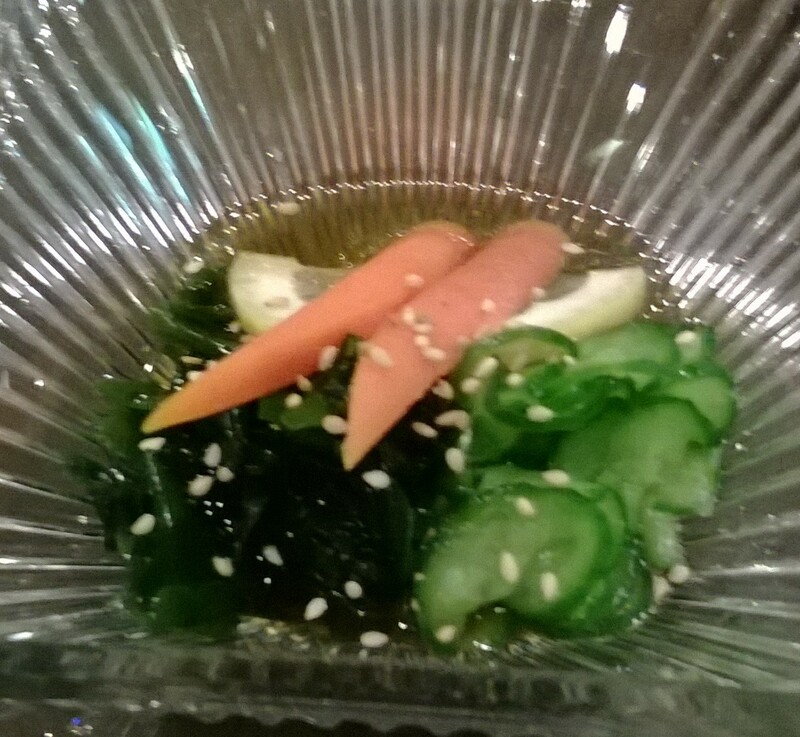 We proceeded to order the sushi boat with Beef Julienne, and an order of the Hibachi Scallops. 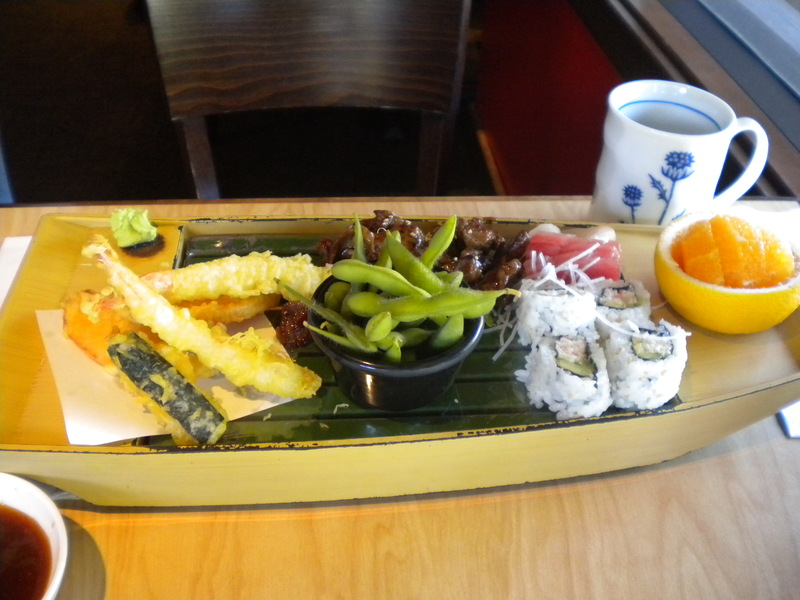 I was surprised by the large size of the boat, and how lovely the overall presentation of the food was. The beef was surprisingly good quality, tender and flavorful, and was enhanced by the slight sweetness of the teriyaki sauce. The batter on the tempura was light and not greasy. 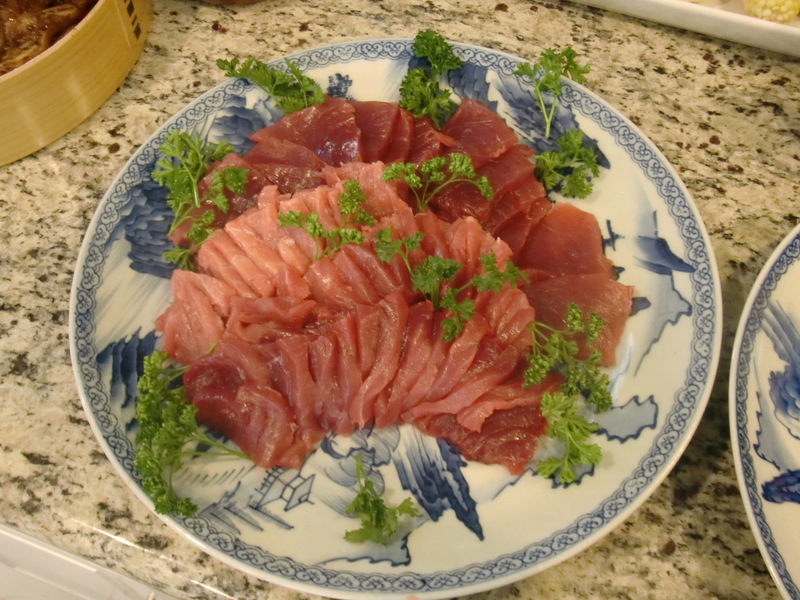 Sashimi came with slices of tuna and white fish, though not the top of grades, they were nevertheless, enjoyable with the rest of the offerings. 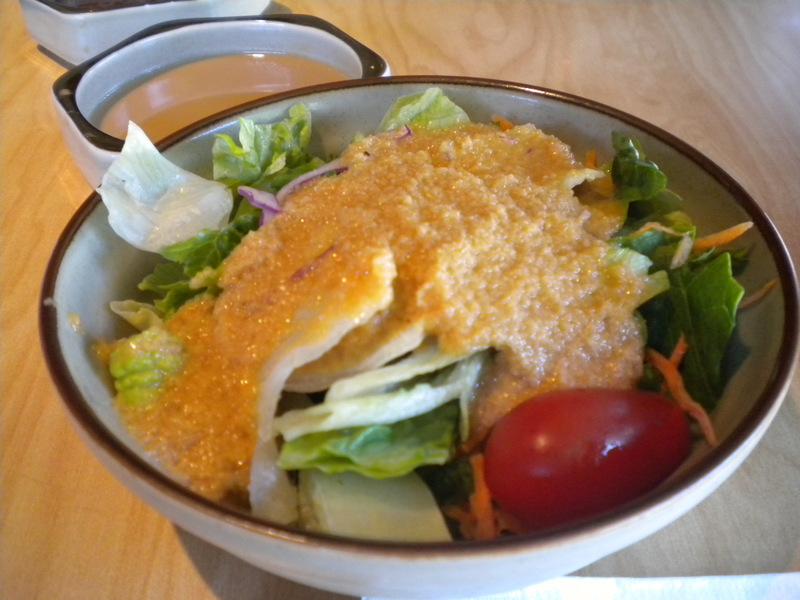 I especially like the tangy dressing on the very fresh and generous portion size of the salad. 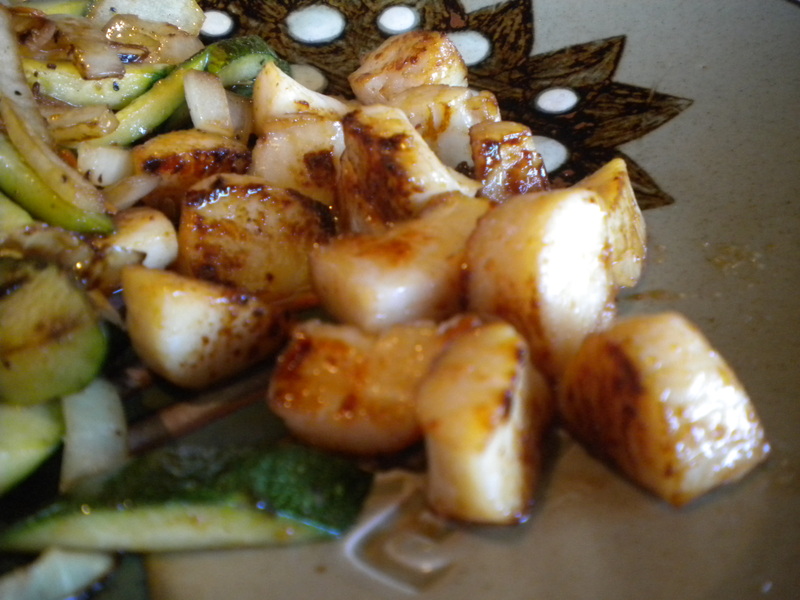 My Hibachi Scallops was every bit as good as it would be, even though it was not cooked on the teppanaki side. The scallops tasted fresh, mildly sweet, and not chewy. The hibachi vegetable rice was savory and satisfying. 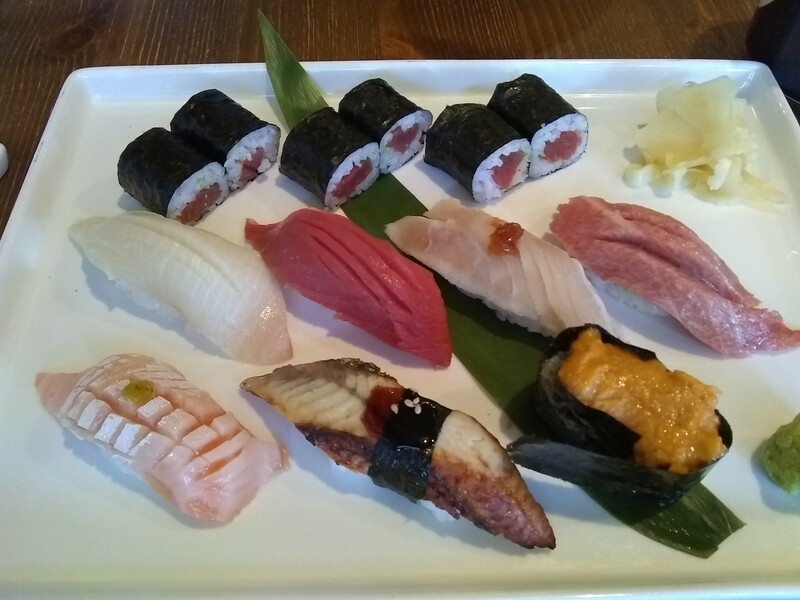 I had tried various sushi and rolls on other occasions, and I was pleasantly surprised by how strikingly fresh tasting they all were. My favorite, the uni (sea urchin) was consistently creamy and smooth, with a nutty sweet taste, even better than some of the best sushi restaurants in town. The Caterpillar Roll, a huge roll made with eel, cucumber, avocado was exquisite. The eel was firm, yet delicate and moist, with a generous amount of sensuous, buttery avocado slices wrapped all around the roll. One can receive a $30 Birthday Gift Certificate during the month of the birthday after joining “The Chef’s Table” at the Benihana website, which I think is one of the best deal in town.